The 2018 Dodge Durango SXT gets its charm from its gutsy power and intimidating looks. The Fiat-Chrysler bad boy is adrenaline-powered and is the most powerful and fastest SUV on American streets. The standard rear-wheel drive and Hemi V-8 earns it a place alongside the Challenger coupe and the Charger sedan, even though it’s a large vehicle that can seat seven. The Durango’s towering capabilities bests its rivals with a maximum towing capacity of 6,200 pounds, metallic paint job, and 18-inch satin carbon aluminum wheels. Unrivaled as a family-friendly crossover with serious attitude, the Durango offers these advantages and more. 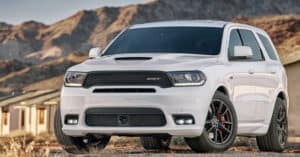 Here is our list of the 2018 Dodge Durango’s features you have to check out. Although the eight-speed automatic transmission and 293-hp, 3.6-liter V-6 engine is a powerful combination, Durango drivers have the option to boost their SUV’s towing capacity with a 360-hp 5.7-liter V-8 engine. The V-8 allows the Durango to zero-to-60 mph in just 6.2 seconds, a speed that is comparable to the Ford Explorer V-6 and GMC Acadia’s offerings. Phone Commands–the Uconnect Voice Command makes it simple for you to make phone calls and ends them with an easy press of a button on the steering wheel. Speed Control–This allows you to set a speed on a long drive and maintain a set course while cruising. Paddle Shifters–With the available steering wheel-mounted paddle shifters, as the driver, you can easily control the eight-speed automatic transmission. Instrument Cluster Controls–You have a variety of buttons on the steering wheel to control the customizable 7-inch touchscreen and digital information cluster. Parking assistance that helps to avoid a potential accident with the ParkSense Front and Rear Park Assist System. The blind spot monitoring system alerts you should any vehicle enter one of your blind spot zones or while changing lanes. Big-league braking that allows you to monitor the speed of each wheel and allows you to control the brake of each wheel independently for superior control. When it comes to SUVs, the Durango’s dependability, ride quality, fuel economy, acceleration, and handling outsmarts its competitors with its state-of-the-art features. So stop by a dealership today and check out the Durango. Once you get behind the wheel, you’ll rule the road with confidence!